When Daniel Craig drove the all-new 2014 Range Rover Sport into New York, the new SUV was supposed to be the hit of the show but who really was the star? 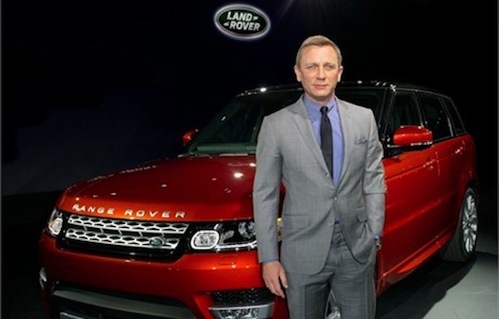 When Land Rover came up with the marketing plan for the all-new 2014 Range Rover Sport to make its world premiere, they chose Daniel Craig to drive the new SUV through New York. What better actor could they have chosen than James Bond and SKYFALL actor Daniel Craig? But as the short movie by action film director Jonathan P B Taylor began to unfold, who really was the star that night? It's reported by Perthnow.com.au that Daniel Craig made $1 million U.S. for his appearance at the show that night. Daniel Craig gets behind the wheel of the new Sport and the film begins with the the British actor starting up the newly designed crossover. But it’s his driving skills through a crowded shipping yard that reminds the viewer of James Bond. As Craig drives the vehicle over the Brooklyn Bridge and through the streets of New York, you get the sense that not just anyone could pull this off. It’s not your average Sunday drive through lower Manhattan. The drive takes James Bond, I mean Craig, through a construction zone and flooded tunnel before coming out onto the city streets again. Who really is the star of the reveal? But it’s Craigs reflection in the rear view mirror that gives away who the star really is. And as the British movie star pulls into the tarmac where the guests have gathered to catch the first ever glimpse of the new Range Rover Sport, there are flash bulbs going off as he pulls the vehicle in. The guests give Craig a big cheer as he exits the Sport. But it’s not the Range Rover Sport that’s announced to the guests, the announcer says, “ladies and gentlemen, that you very much indeed, lets welcome Daniel Craig!” The James Bond star waves to the crowd and exits the stage. The all-new Range Rover Sport is left there in a supporting role. But even though Craig stole the spotlight away from the new 2014 Range Rover Sport, it’s still quite a vehicle worth mentioning. The new Sport has been remade from the ground up and is the fastest, most agile and responsive vehicle Land Rover has ever built. It features a new aluminum structure with a weight savings of approximately 800 lbs from the outgoing model. This helps the new crossover to be more agile and has improved performance, better fuel economy and reduced emissions. The Range Rover Sport is the best-selling Land Rover product in North America, and more Range Rover Sports are sold in New York than any other metropolitan area in the world. It features a new 5+2 third row seating option for a more flexible seating and function. The new cabin gets the Land Rover luxury and quality interior New York buyers have come to expect. The new Sport comes with a choice of a 340 hp supercharged V6 SE ($63,495) or a 510 hp supercharged V8 engine ($79,995). Both powerplants come mated to an eight speed automatic transmission by ZF. There are a choice of transfer cases; a single speed Torsen or two-speed locking with low range. The improved fuel economy is aided with the use of an Intelligent Stop/Start technology that also helps reduce emissions. Global buyers can also chose the optional new fully automatic Terrain Response 2 system for those all-terrain James Bond escapes. Even though Daniel Craig stole the show and received $1 million for the world premiere of the 2014 Range Rover Sport in New York, the new SUV still is a star in it’s own right. Look for the newly-designed SUV to go on sale here in the U.S. and around the globe at the end of the year. Watch the Daniel Craig drives all-new Range Rover Sport in New York video and see who you think the star is. A reader just let me know that the BBC reported that Craig was paid $1 million U.S. for about 10 minutes of work! It may have taken longer than that to shoot the movie, but he really was the star! Not bad work if you can get it...Thanks for the info Bob.